PHILIPSBURG – Golden aspen and cottonwood leaves filtered an October sun that hadn’t risen high enough to touch the restored shingles of the Morgan-Case cabin hidden in the pines. Smoke from the cabin’s historic rock chimney spiraled up to catch the sunlight, and inside the cabin, Sharon Attebery of Westcliff, Colorado, prepared lunch for a dozen hungry volunteers. Looking through the aspen, she could see them toiling in the nearby clearing. More than a year ago, she wouldn’t have seen much more. But now, the bottom half of a new barn filled the gap in the trees. 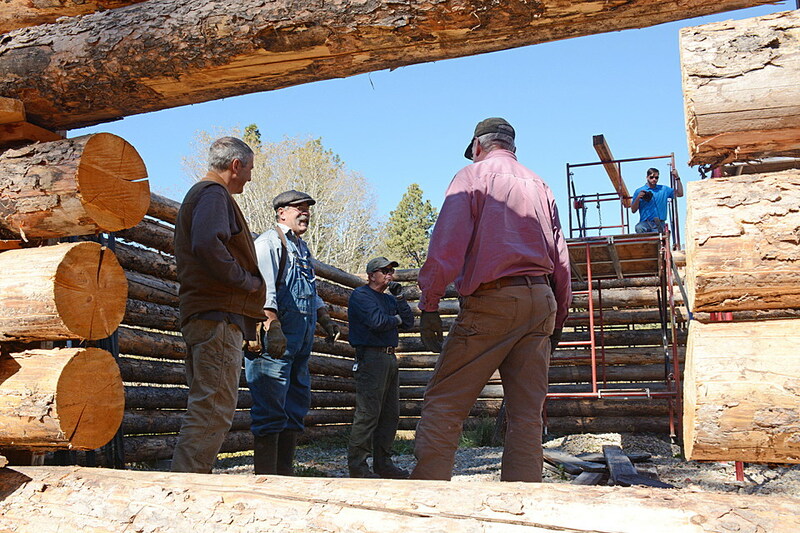 All this week, the Friends of Upper Rock Creek, a nonprofit group, have been holding an old-fashioned barn raising at the Morgan-Case Homestead about 30 miles up Rock Creek Road. But this is no modern pole barn they’re building, although it was designed using 3D technology. The organization, along with U.S. Forest Service preservationists and archaeologists, are recreating a 1920s-era gabled barn that collapsed under heavy snow in the winter of 1996. All that remained standing was the lower three feet of the log walls. The rest of the barn was a jumble of bits and pieces, mainly the roof and upper floor. 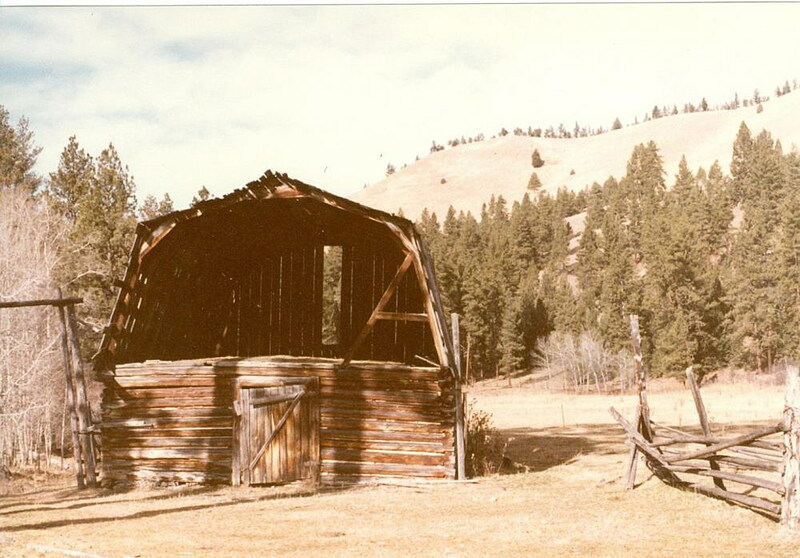 Fortunately, Friends founder Milo McLeod had photos of the barn when it was mostly intact in 1978, shortly after he had been hired as one of the first archaeologists to work for the USFS. So even after he retired, it was always a goal to bring the barn back. “In order to interpret a historic farmstead, you need a barn,” McLeod said. To rebuild the barn, the volunteers are using a combination of old and new methods. 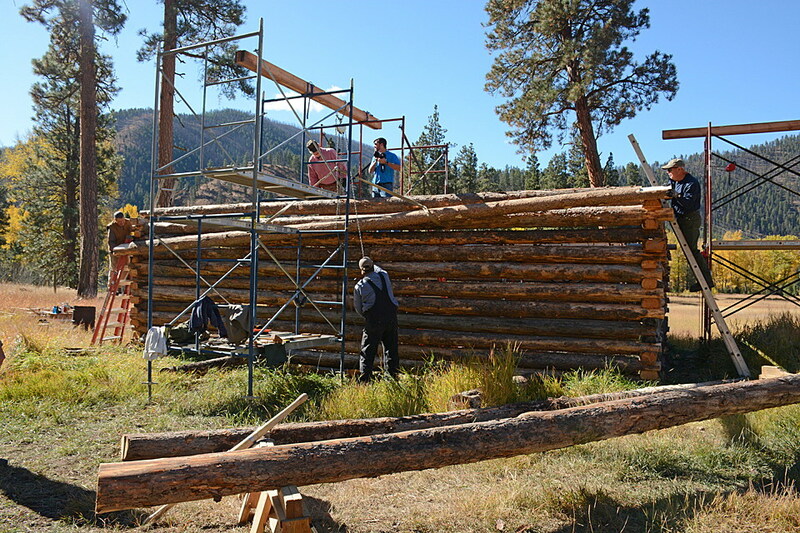 On Wednesday, they used scaffolding, chains, pulleys and timber tongs to maneuver 500-pound logs on top of each other, Lincoln-log style, to build the walls, which were already eight feet high. The volunteers had already spent two weeks on the walls this spring after the Sapphire Complex fires of 2017 canceled their fall work week last year. 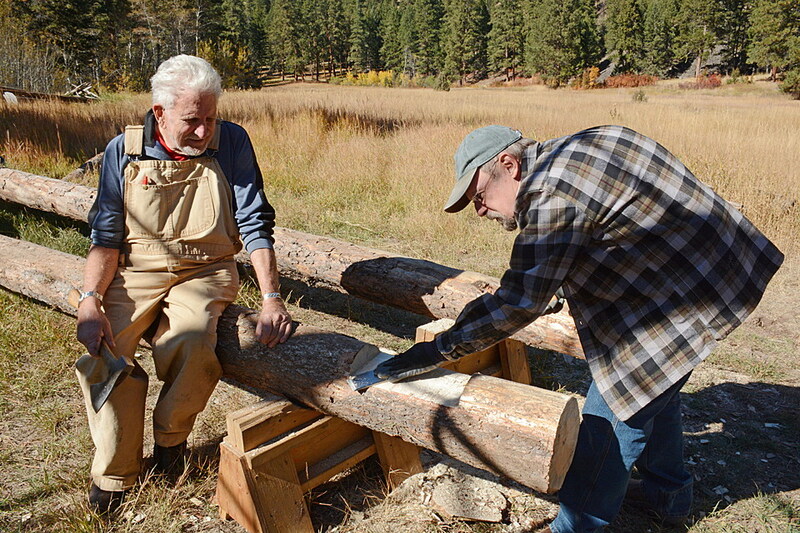 As each log was set in place, Gene Thompson, former recreation forester for the Missoula Ranger District, and Al Fix used levels and tape measures to shift the logs to keep the corners straight. The logs came from a thinning project farther up the creek, so they had chainsaw marks on the ends. USFS preservationist Cathy Bickenheuser said the volunteers would use handsaws to cut a little off the ends to give them an authentic look. They also used chisels to dig out the end-notches and special hand axes to flatten the sides of the logs to be used as floor joists for the loft. Bickenheuser was breathless as she finished a log joist with a rough-hewn surface and a pile of woodchips to show for it. “For any part that the public can see, we use traditional methods,” Bickenheuser said. The Forest Service bought the Morgan-Case and Hogback homesteads in 1979 with money from the Land and Water Conservation Fund. Over the years, McLeod and the USFS oversaw $200,000 worth of projects to restore the existing Morgan-Case buildings. But McLeod couldn’t stop there. After he retired from the agency in 2008, he founded the Friends to keep the restoration effort going. Generous donations from the Harry Willett Foundation help pay for project materials and services. When the Friends gained approval from the USFS to actually rebuild the barn, Bickenheuser and preservationist Jack Poppen jumped at the chance to do something other than restoration. They were there in May 2017 to monitor the deconstruction of the old barn and were thrilled to have a hand in building the new. Especially after they saw the 3D design drawings that engineers had managed to reconstruct from photographs. “We normally build from the top down. We never get to go from the bottom up. So we’re part of this because we want to learn too,” Bickenheuser said. All the restoration work has helped several of the volunteers become familiar with traditional techniques. But this time, they’re learning a new skill: using lime mortar. Before the use of Portland cement became widespread, homesteaders used a variety of material to seal log buildings from drafts. The original barn had wooden shims between the logs. But former USFS preservationist Kirby Matthew recently learned how people living near the Missouri Breaks used limestone to make lime mortar. So he brought some limestone to Rock Creek to try it out. All morning, while they were wrestling logs into place, Matthew had a fire going in a modified burn barrel where limestone was cooking at close to 1,000 degrees. Later, it would be crumbled, mixed with water into a lime slurry and daubed between the logs. By the end of the week, the Friends will have worked more than 400 hours – about $12,000 worth of effort – on the barn, but it still won’t be finished. Matthew estimated they’d be able to finish the walls and the loft floor, but they’ll have to wait until spring to finish the 16-feet-high gabled roof. Without hesitation, all the volunteers said they’d return, even though a few live out of state. Most have returned faithfully for the past 15 years, since the time when the homestead projects were part of the USFS Passport in Time program, which paired volunteers with agency archaeology and restoration projects. With such dedication, it’s not surprising that about a month ago, the National Museum of Forest Service History recognized the group’s decade-long effort with its 2018 Historical Restoration Award. Fred Smith, a Verizon employee from Silverton, Oregon, started making his annual trek to the Missoula region in 2005. He’s helped bring much of the Morgan-Case homestead back to life, but his fondest memory is finding Annie Morgan’s medicine bag hidden in the front-door jam. Rumored to have been an African-American cook for Gen. George Custer, Annie Morgan built the homestead in the 1880s. She ended up living with Civil War veteran Jack Case after she helped him recover from typhoid. Smith enjoyed himself so much that he recruited his friend, Pete Warren, who now commutes from Arizona where he recently retired. “It’s Sharon’s meat pies – we wait all year for those,” Warren said. Restoration is a never-ending task, especially when the USFS is seeing more acts of vandalism. In the winter of 2016-2017, for example, vandals damaged the Rock Creek cabin, not for the first time. They may be family but the Friends know they need to recruit younger people. They’re almost all past retirement age. It’s getting harder to hoist logs into the air, and they need to pass on their knowledge. Bacon used to consider herself the newcomer until she realized she’s been working on restoration projects for almost 20 years now. She still organizes volunteers on USFS projects, but funding is dwindling. So groups like the Friends are essential for keeping historic sites alive on public lands. For people interested in archaeology or restoration opportunities with the Forest Service, contact Bacon at sbacon@fs.fed.us or go to www.fs.usds.gov/lolo.